I intended to have this post up last week, but obviously that didn't happen. I'm still working on building routine, still working on having grace for myself when things don't go according to plan. But here we are, better late than never. I read a lot of books in August, more than I have in one month for a very long time. The library just kept sending me emails informing me that the books I'd placed on hold had arrived and were ready for pickup, so I just kept reading. I had at least a dozen library books at home at any given point last month. And then there was the time that I read three entire books in a twenty-four hour span. There are several that are still sitting on my shelf with a bookmark midway through that I need to sit down and finish. As I stacked these books up to take a picture of them together, I realized that everything I read in August was nonfiction, and largely faith-based. Who would have thought that my diehard fiction-loving self would shift that drastically? But it was a month of some really good, challenging reads. Some were better than others, but overall the quality of these books was great. I'm definitely late to the enneagram game, but better late than never, I guess? After being fascinated by other personality tests like the Myers-Briggs system, I suppose it was only a matter of time. This book has been around for a couple of years, and breaks down each of the nine enneagram types and discusses their tendencies for better or worse. And then I got to the section on my type (which is 4w3, by the way), and felt extremely seen and extremely called out. It was good. This is one of those books that helped me understand a little of where other people are coming from, and was just a really interesting read overall. When I picked up this book, I was quite looking forward to it. But for being a book about radical generosity that was supposed to be from a Christian perspective, there was surprisingly little Jesus in it. There were lots of practical ideas for living a lifestyle of generosity, but most of them were focused on how they made the individual *feel,* and on giving out of that which doesn’t actually change our hearts or our lives, which made me a little uncomfortable at times. Virtually unexplored was any conversation about how Christ's love compels us to give and serve others, about the ways in which radical generosity - giving though it costs us - is a characteristic of the kingdom of God. I finished the book, but it felt bland and left me quite dissatisfied with the experience. I always appreciate Sarah Bessey's words, and this was no exception. Her books keep showing up in my life at just the right moments, reminding me that other people wrestle with the same questions, concerns, and hopes. Every time she brings up the Bullfrogs and Butterflies album that was so instrumental in bringing her and her family to faith, I get a huge wave of nostalgia because I had the same album and listened to it endlessly when I was a kid. It's not an analytical theology textbook, but a reminder that it's okay if things feel messy and that sometimes all we can do is wade right through it knowing that Jesus meets us along the way and at the other side. Anne Lamott is one of those authors whose work I see in different places, but have never really read much of her work. This book was a quick read (it took me just over an hour one evening), but a good one, though the chapter 'Help' is the best part by far. It's an interesting conversation about the ways we speak to God, and though it's certainly not a book for everyone, I enjoyed her poetic exploration of the topic. Here's a favorite quote from the book: "Prayer is taking a chance that against all odds and past history, we are loved and chosen, and do not have to get it together before we show up." I've been looking forward to reading this one for several months now, and it did not disappoint. Austin Channing Brown's memoir is moving and challenging and powerful. She speaks honestly about her experiences as a black woman with a 'man's' name living in America, and the everyday realities of racism that she and so many others encounter. It's not meant to be a comfortable read, but I think it's a truly important one. This one should be on your reading list no matter who you are. It's that good. If you've ever experienced, illness, grief, or loss, you'll find something to appreciate in this book. Kate Bowler writes a raw memoir of living with a terminal cancer diagnosis and all the unfortunate things people say because they don't know what else to do. It's got lots of wisdom about living in the present moment and loving the ones you're with, and she includes a very helpful index of things never to say to someone who's facing terminal illness or dealing with any other kind of grief, then contrasts it with some much better alternatives. Overall, a good, if wrenching read. I'd heard good things about Richard Rohr's writing, and decided to pick up this book first because it was short. Little did I know, it was also densely packed with wisdom and reflection, so it was not nearly as quick a read as I had anticipated. There was lot that was good inside it, but his writing style is not one that allows you to skim at all. I sometimes found his words to be a little too flowery, but overall still enjoyed it and would happily pick up another piece of his work in the future. Full disclosure: I haven't actually finished this one yet because someone else had a hold on it at the library so I wasn't able to renew it and finish it before returning it. I'm hoping to either borrow a copy from someone or to grab it from the library when it's available again and finish it properly. But I liked what I read so far. Bob Goff writes as a light-hearted storyteller and weaves in all kinds of truth along the way. If you liked Love Does, you'll probably like this one too. 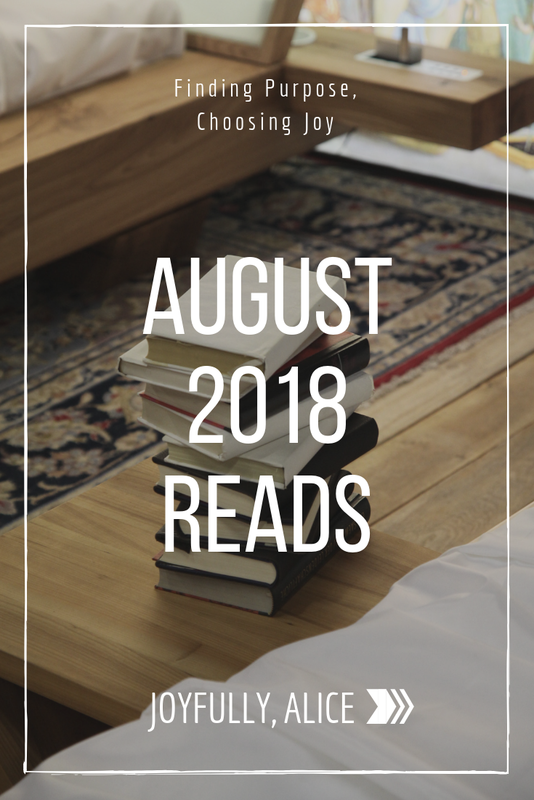 So there they are, my thoughts on the things I read in August. At this point, I'm ahead of schedule on my Goodreads 2018 Reading Challenge, and have another big stack of books to read before September is finished. I'm also considering starting an Instagram account dedicated to the things I read, so that I can share more regularly what I'm reading without completely annoying all the people who follow my main account. Did you read anything great this summer? Tell me about it in the comments below! Wishing you the happiest of Thursdays.